John Spencer, the actor who plays politician Leo McGarry in NBC television's The West Wing, has died of a heart attack at 58. The actor died in hospital in Los Angeles on Friday, his publicist said in a brief statement. The seventh series of the political drama is currently being shown in the United States. Spencer previously starred in NBC's LA Law series while big screen roles included Green Card and Copland. The Associated Press notes that, in a sad parallel to life, the Leo McGarry character also suffers a heart attack that forces him to give up his White House job as chief of staff. However, in the TV series, he recovers and returns to politics. Spencer, who also starred in LA Law as attorney Tommy Mullaney, received an Emmy Award for his performance in The West Wing in 2002 and was nominated four other times for the drama. "Like Leo, I've always been a workaholic, too. Through good times and bad, acting has been my escape, my joy, my nourishment. The drug for me, even better than alcohol, was acting." John Spencer grew up in Paterson, New Jersey, the son of working-class parents, and he studied at the Professional Children's School in Manhattan. His big break came in 1990 when he played Harrison Ford's detective sidekick in the 1990 courtroom thriller Presumed Innocent. I want to send by condolences to the family of John Spencer. He was a great actor. I have watched him over the years and he touched my life particularly his portrayal of Leo McGarry in the West Wing, acted with grace, brilliance and a twinkle in the eye. He will be greatly missed. An extraordinary actor on an extraordinary show. Spencer achieved more with a facial expression than most dramatic actors could convey with a monologue. His private life was beset with similar problems to his character's, and that made him a heartbreakingly honest spokesperson for the issues of alcoholism, addiction, and being grateful for his life. We are shocked and saddened at the death of John. We were fans of him in LA Law, but, in The West Wing, he brought a steely toughness to the role of what we believed the chief of staff should be. The West Wing is, without doubt, one of the finest, best sustained dramas ever on TV. 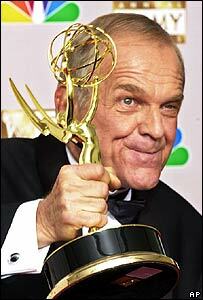 John Spencer, as Leo McGarry, was one of the finest actors in it. He breathed real character into a wonderful script and, as main support to President Jed Bartlett, helped carry the show. As the character developed and grew, so did his grasp of the role and of its often pivotal part in the drama. If only real-life Chiefs of Staff were as honest, as true and as real as McGarry! He will be sorely missed, both in real life and on the set of WW. The untimely death of John Spencer has robbed us of a fine actor and as Leo McGarry in the West Wing, one of the original cast of the best TV drama for the past 7 years and the only show I have to watch. He along with the rest of the cast created a Whitehouse you could only wish for. He will be sorely missed. John Spencer was such a REAL, BELIEVABLE actor. My now deceased former husband of 20 years was a successful businessman, a very complex person, and an alcoholic. I raised three sons, none of whom drink today. I had taped that most incredible WW episode where Leo flashes back to how he fell off the wagon with some very old scotch (Johnny Walker Blue). I showed this remarkable scene to each of my sons to help explain to them the complexity and insidiousness of their father's disease. It left its mark. Thank you, John Spencer, for some of the best acting I have ever seen. John Spencer was a fine and gifted actor who never failed to deliver a good performance. As a fan of The West Wing from season 1, I shall deeply miss this versatile and talented performer. He was a truly wonderful actor in a wonderful show. The West Wing will not be the same without him. Being too young to remember LA Law, I only became familiar with Spencer through his work on the West Wing. He breathed life into Leo McGarry and made him a character that we all wanted to be friends with, and I am completely devastated by this tragic news. John Spencer was a fine actor and will be sorely missed, and my heart goes out to his family and friends. If they do make another series of the West Wing now, it won't be the same. John was an amazing actor, who brought so much to the series. He overcame challenges in his personal life that most of us would crumble at. You brought happiness into the homes of millions through your work, and now it's your turn to rest. Thanks for all you've given the world! The world has lost a wonderful actor, and the West Wing has lost its heart and soul. John Spencer was the unsung hero of the best TV show of my lifetime, and deserves to be remembered as a great. Rest in peace Leo. The actors were what made The West Wing the greatest show ever to appear on television. John Spencer was chief among them and he will be sorely missed by all who watched the show. What a sad day, The West Wing won't be the same. Why do all the best people die young? I have the DVDs so shall be able to have a memory of a great actor. I've really enjoyed watching John Spencer as Leo in The West Wing and I'm saddened to hear this news. He created a very real character in Leo and I will certainly miss his performances. A fantastic actor and my favourite character on The West Wing. I'm sad to hear he's passed on. My thoughts are with his family and friends. Watching him in West Wing you had to admire his timing, his delivery and his ability to hit the right emotional pitch. In a series surrounded with some of the best in the business, he was always the equal and often the best in any scene he was in. Never trying to steal the show, just his portrayal was spot on. Will be missed. A truly brilliant actor who has been cut down during the high point of his acting career; a very sad day for the acting and broadcasting world. I was huge fan of John Spencer. He brought so much humanity to his role on The West Wing. He seemed to like his part on that show in real life. We will all miss him and The West Wing will not be the same without him. God Bless you, John, you have gone too soon. I mourn the tragic loss of a quite brilliant actor. His portrayal of Leo McGarry for almost seven full seasons on The West Wing was fantastic and gave a great insight on how the Chief of Staff is quite literally the 'Co-President'. It is a shame as he would have made a great Vice-President to Matt Santos. My thoughts and prayers are with John Spencer's family, I'll miss you John. Leo was, for me, what Robert Duvall was to Marlon Brando in The Godfather; Bartlet's right-hand man, his advisor. His character always knew what to do and how to solve a problem. As President Bartlet once said "Leo's made of leather, his face has a map of the world on it. Leo comes back". Sadly, not this time. Rest in peace Leo. John Spencer will be sadly missed. He was a fantastic actor who played a flawed but strong character in The West Wing, but both as Leo McGarry and himself, he showed that you can still reach the top regardless of your past. Quite simply the man was a legend. Awesome actor, nice bloke and will be sadly missed by all film and TV fans - not just fans of the West Wing. A truly talented actor who gave a depth and dimension to the roles he played that we very rarely see in the modern acting world. Leo McGarry was (next to Jed Bartlett) my favorite character on the West Wing and one of my all time favorite characters on television. The untimely and premature death of John Spencer will leave a deep void in the acting industry and many of us around the world will miss seeing his face and his wonderful acting grace our television screens. Rest in peace John Spencer and thank you for your contribution to this world. My sincere and heartfelt thoughts, prayers and condolences go out to John Spencer's family on the loss of such a wonderful man. This is a very sad day. My thoughts go out to John Spencer's family. My favourite TV programme will never be the same again. What very sad news, like many fans of the fantastic West Wing series, Leo McGarrity was always my favourite character. John always exuded old school charm and panache, and put you in mind of Gene Kelly or Sinatra. He brought us countless moments of immense pathos as Leo, and was often portrayed as the real strength behind the president, I often found myself wishing real life imitated art as I watched John and Martin Sheen in action as Leo and Jed. You will be missed dreadfully John, we have lost a true gent, god bless. I will always remember him for his role in The Rock. He was a brilliant actor and his death is a terrible shame. Farewell Womack! With him now gone, I'm now the poorer with just Martin Sheen and CJ to look out for on my all-time favourite political drama. Spencer, you were a good Chief of Staff. John Spencer was an extraordinarily talented actor who played many diverse roles. In The West Wing, he made the most of the brilliant writing to question the status quo of political discourse, becoming a much loved character and screen presence. He will be sorely missed. Without doubt, the most convincing and watchable character on West Wing. I'm certain he was the favourite of most viewers, and Leo McGarry will be sadly missed, almost as much as John Spencer. Always a true charm on the telly, Spencer made the White House role seem like he was in your living room rocking the part of a great man. With the attitude of a father figure, and a demonstrative showing as a true professional. Rest in peace my good man, Leo McGarry, you were a fine Vice President, and a true man in great spirit and personality. John Spencer's portrayal of Leo McGarry was brilliant, completely faultless. He brought a huge array of acting talent to bear on scenes that demanded anything from cranky humour or heartfelt kindness through to gut-wrenching sadness or pounding fear - all with understatement and subtlety. A lovely character, a lovely man, and possibly one of the greatest but undervalued actors of our time. Such a tragic loss... He is one of the people who was responsible for bringing a cast to life and making them shine, in a way that instilled hope for a better real life future through the most sophisticated TV show television has ever seen. Thank you, John Spencer. John Spencer was an amazing actor. In a show with an outstanding ensemble cast, John stood apart with his acting always being sheer perfection. From his entrance into The West Wing, through the story of his alcoholism in Bartlet for America, from his reaction in Twenty Five to the scarily accurate heart attack scene in The Birnam Woods, Spencer managed to make Leo a real person and not just a character in a television show. He'll be sorely missed, and here's to many more 'big block of cheese days' to come.